Tapas is a major part of Spanish life, and this is seen nowhere more than in Madrid. The word &apos;tapas&apos;, from the Spanish &apos;tapar&apos;, to cover, refers to small plates, which can be either hot or cold, that make up a large portion of the Spanish diet. In Madrid, this tends to include dishes such as &apos;croquetas&apos; (fried bread-crumbed rolls, usually containing bechamel sauce and one or more of ham, mushrooms and seafood), fried calamari and &apos;tortilla de patatas&apos;, a Spanish omelet made with potato and onion. In the 17th century, tapas were originally served with alcoholic drinks so as to curb drunkenness and, in many bars and restaurants across the city, you will still be given a tapa (the singular of &apos;tapas&apos;) with your beer or glass of wine. 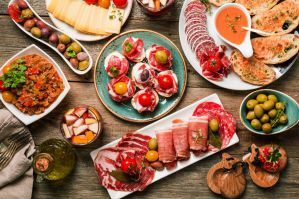 If you want to truly explore the best tapas that Madrid has to offer, a tapas tour can be one of the best ways to do so. With passionate, knowledgeable hosts and guides, these are perfect for exploring some of Madrid&apos;s best-kept secrets, tasting tapas and wine of which you would perhaps otherwise be completely unaware. Below are some examples of the excellent tours on offer. This tour gives you a true &apos;Madrileno&apos; experience. Excellent value for money from under $50 per person, you will spend the whole evening learning about the history of tapas, as well as trying some of the best the city has to offer in at least 4 bars and restaurants. The price includes entry to one of Madrid&apos;s exclusive &apos;tablao&apos; bars, where you can soak up the atmosphere of a traditional flamenco show, not to be missed, and this is then followed up by a pub crawl, with complimentary shots and excellent discounts in some of Madrid&apos;s most popular drinking locations. A shorter experience, this tour is perfect for bringing out your inner foody. 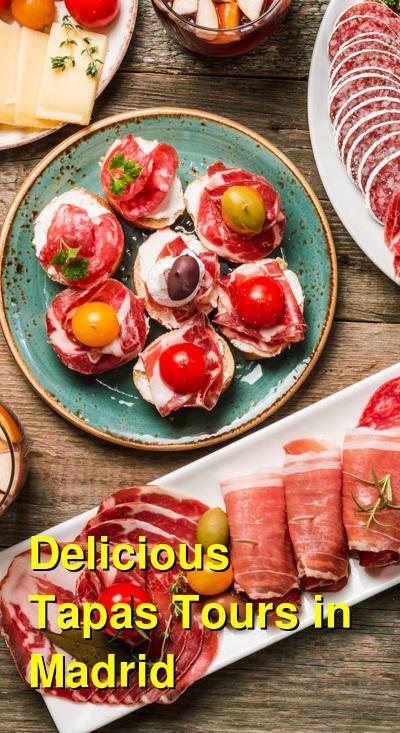 Immersing yourself in Madrid&apos;s culinary world, you will learn about the rules and the history of tapas in Spain and, more specifically, Madrid, as well as, of course, sampling some of the best available for a small supplement. The guide will advise you on the best drinks to go with each tapa and on the best dishes in each restaurant. This 6-hour tour gives you a true all-round experience of the myriad of eateries available in Madrid. Starting in the city center, before moving on to a farmers&apos; market, the guide will take you back in time to explain the history of tapas, before moving on to a modern tasting market, a city winery and a family-run bar, through which you can truly experience the culinary diversity on offer here, and learn about the differences between all the many types of food available in the city (pintxos, tapas, raciones, etc.). Incorporating 5 locations across the historic yet trendy southern part of Madrid&apos;s center, this tour is not to be missed. Particularly perfect for seafood lovers, your guide will provide a humorous yet informative history, before guiding you round a number of restaurants and bars where you will sample some of the best dishes the city has to offer. Your experience ends in an 18th century sherry bar, which feels like a trip back in time, with an atmosphere unchanged from that of its past. This 4-hour tour incorporates just 3 of the city&apos;s best bars. You are given the opportunity to spend a little more time in each than in some of the other tours, and the guide explains the significance of the food, the drink and the general history (and the mysteries) of each area. In each establishment, you will be given drinks and tapas, before embarking on a bar crawl, with free entry and complimentary shots in each. This tour is based in one of Madrid&apos;s trendiest neighborhoods, Lavapies. Your local host will expertly guide you around four of the area&apos;s best bars and restaurants, a free tapa and drink provided in each. With local alcohol, from wines to vermouths, and exceptional regional tapas, this tour is one of the best ways to truly soak up the atmosphere of Madrid and discover places off the beaten track.